Compact, high precision manual XYZ digital video measuring system with DRO digital readout on computer and 1 micron XYZ precision. 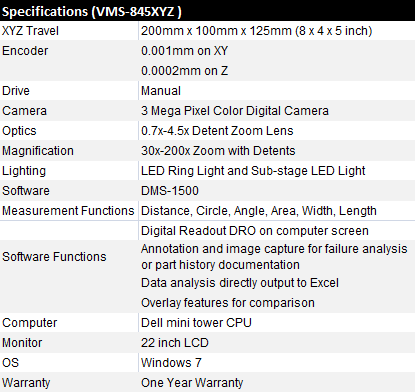 VMS-845XYZ is an easy-to-use, powerful video based 3-axis manual measuring system. 3M digital camera. The ultra-large image without compression and conversion greatly improves the sub-pixel accuracy and throughput. The software selectable resolution balances the speed and resolution. 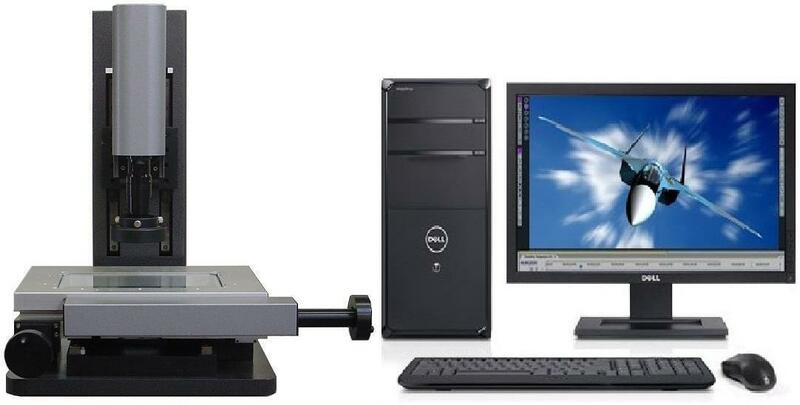 The basic system uses DMS1500 dimensional measurement and imaging software. The measurement software is very easy-to-use and provides functions for broad applications. Such as measurement, inspection, comparison, annotation, image capture and documentation. Optional DMS-3000 software is designed for manual vision measuring system with edge detection and part programming. It provides full video CMM measuring machine capability and is easy-to-learn. The stage mapping capability greatly improves the system measurement accuracy. The software also provides broad imaging functions to have a value added on the system.